The other day whilst I was on Facebook, I saw a post about the names of each state in Nigeria and how they got their names. As it has been a while since I wrote a post on Nigeria, I think this is the perfect time to share one. Abia is an acronym derived from the name of the four main groups of the people in the state as at the time it was formed in 1991: Aba, Bende, Isuikwuato & Afikpo. This state was named after a warrior that conquered the region in the beginning of the 19th century. His name was Modibbo Adama Bin Ardo Hassan. Akwa Ibom is named after a river, the Qua Iboe (or Kwa Iboe) River. (Omambala) River (in Igbo, the native name of the river is Ànyịm Ọma Mbala). There are 3 versions of how Bauchi got its name. One version says ‘Bauchi’ is Hausa word meaning the southern flanks of Hausaland. Tribes living in the southern parts of the Hausaland were referred to as “kasashen bauchi”. Bayelsa was formed as a result of the clamour from the three LGAs in old Rivers (Brass LGA known as BALGA, Yenagoa LGA known as YELGA and Sagbama LGA – SALGA). The name came about from the combination of their acronymns. BA + YEL + SA = BAYELSA. It is a word from the Batta language ‘Binuwe’ which means ‘Mother of Waters’. The name was derived from ‘Borno’, an alternative name of the Kanuris who form the predominant ethnic group in the state. The state took its name from a River called Oyono or Cross River. It was named after the delta of the River Niger formed as it enters the Atlantic Ocean. The state was named after the Aboine River that cuts through Abakaliki, the state capital. Named after the Bini people who had always referred to themselves as Edo or Iduu. ‘Ekiti’ is a term that is said to denote a settlement of many hills. Enugu derived its name from two local words “enu” & “ugwu” which means ‘top of the hill’. Named after the dialect of Fulani language (Fulfulde) spoken in the area ‘Gombe’. This state is named after the Imo River (Mmiri Imo). I sincerely hope the current Governor doesn’t rename the state to Rochas Foundation before his tenure elapses. The state was named after its distinctively golden-coloured soil, Jigawa. The state after the crocodiles in Kaduna River. “Kadduna” is Hausa plural word for crocodiles. The state was named after a blacksmith of the Gaya tribe who settled in the area while sourcing for ironstone. His name was Kano. Katsina was named after the wife of the local ruler known as Janzama. Her name was Katsina. Legend has it that Kebbi was named after the Ka’abba in Mecca, Saudi Arabia. The name Kogi was said to have been derived from ‘kogi’, (hausa word for river). This is to represent the fact that the two biggest Rivers in Nigeria, River Niger and River Benue form a confluence in the state. This was named after the River Niger which forms the Northern border of the state. The Nupes used to call the river, Kwara. The name is a Portuguese word for lakes. The Portuguese were the first settlers from Europe to reach Lagos in 1472. The name was inspired by the lagoons and rivers in Lagos. It was so named by the founder of Nasarawa kingdom, Makama Dogo. Nasarawa means Victorious. Niger Named after the popular River Niger. Named after the Ogun River. This was named after the settlers of the old Ondo Kingdom. Ondo is a word for settlers. Like a number of other Nigerian states, it was also named after a river; River Osun. It was named after the Old Oyo empire. A state with many water bodies, Rivers State was named for many of the rivers present in the area. Named after the defunct Sokoto Caliphate. Sokoto is the anglicized version of the Arabic word ‘suk’ which means ‘market’ or ‘place of commerce’. The state was named after the Taraba River. The state was named after Komadugu Yobe (Waube or Ouobe) or River Yobe (or River of Yo). Zamfarawa the land of Jambarawa. The name “Abuja” was derived from Abu Ja, a brother to Muhammadu Makau, the last Hausa ruler of Zaria.Makau had left Zaria after being defeated by the Fulani and settled in the area now known as Abuja. I’m actually glad I published this article about the story behind the names of each state in Nigeria because it has highlighted to me that no longer remember the names of the capitals of each state. I used to know this when I was a teenager. 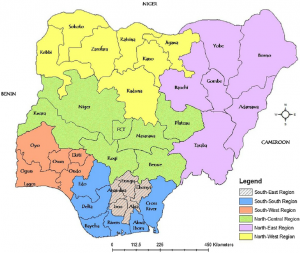 Do you remember all the Nigerian state names and their capital? If you are not Nigerian, do you know all the states and capital of your own country? Please leave a comment below. Please note that I have assumed that everything written in this post about the story behind the names of each state in Nigeria is accurate. If you have any fact(s) to the contrary, please let me know and I will edit it. As Africans, are we losing our connection with the earth? Have you heard of an AMAZING African woman called Yaa Asantewaa? This entry was posted in Segilola's Corner and tagged history, map of nigeria, naija, Nigeria. Bookmark the permalink.